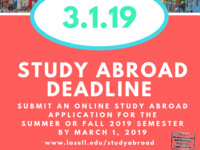 Intending to study abroad in the Fall of 2019? Send in your application with the link below by Friday, March 1st! Those who are interested in competing in the Mr. Lasell event can attend this event to learn more about the event and what to expect.